Lindy Wright invited to become member of Bath Society of Artists, May 2018. Following the successful Annual Open Exhibition at the Victoria Art Gallery, Bath (see below), Lindy was nominated by several of her peers to become an elected member of the Society. The Bath Society of Artists was founded in 1904 with twenty six foundation members. Membership stands at about 120 and is elected by the Executive Committee. Anyone wishing to join must have had work shown at the Annual Exhibition for at least two years, for which there is a selection procedure. Members become entitled to submit three works, again subject to selection; non-members may put forward two. There is an opening ceremony conducted by an established painter or sculptor with influence in the art world. Many distinguished 20th century painters have exhibited and taken an interest in the Bath Society of Artists including Walter Sickert, John Singer Sargent, P Wilson Steer, Gilbert Spencer, William Scott, Patrick Heron, Mary Feddon, Adrian Heath and David Inshaw. This annual exhibition, which is open to non-members, attracts up to 1,000 entries. 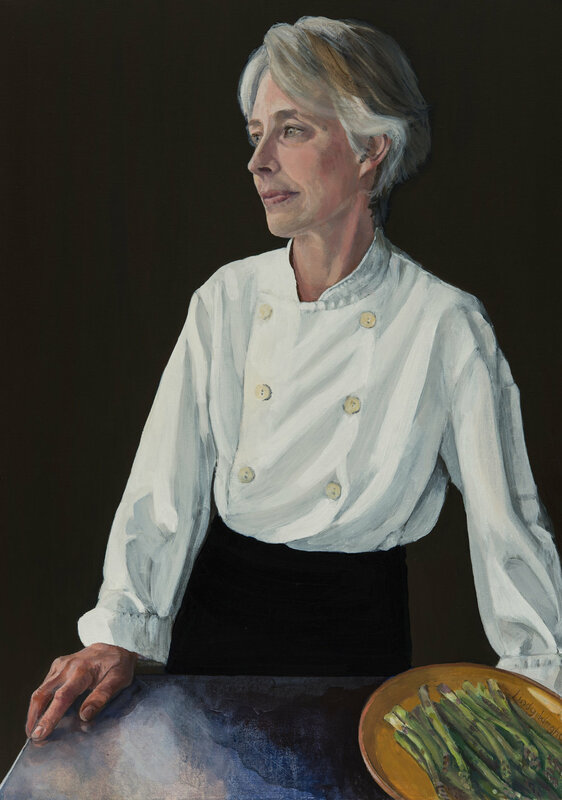 Lindy Wright's portrait of chef, Rachel Demuth (pictured) was selected for the show and sold to an unknown buyer. The Royal Society of Portrait Painters Annual Exhibition, Mall Galleries, May 2017. A painting by Lindy Wright, has been selected from nearly 2,000 entries to appear alongside paintings by some of Britain’s leading portrait artists. The Royal Society of Portrait Painters hold an annual open-submission exhibition in central London each year. Graced by portraits of royalty, celebrities, academics, mothers, daughters, fathers and sons, the exhibition is a feature of the social calendar. Lindy is currently painting a collection of portraits of The Chefs of Bath and one of the series will shortly be hanging alongside the great and good. This year about half of the work will be by eminent Members of the Society and half by emerging artists selected through the open submission. With some 200 portraits on show this is the largest and most comprehensive exhibition of recent portraits in the country. This year’s exhibition will be on display at Mall Galleries, St James’s SW1, between 4th to 19th May 2017. Open 4th to 19th May, 10am to 5pm. Open until 7pm on Tuesdays. Admission £4, Concessions £2.50 (Free to Friends of Mall Galleries and Under 18s). Selected for Royal Society of Portrait Painters Annual Exhibition Mall Galleries, 2017. Lindy's portraits are featured on pages 88-89 of the March 2017 edition of Paint & Draw magazine.